Thanks to its headset, the actor hears a text-to-speech audio that comes directly from the Internet in real-time. The actor repeats the text as he hears it. The textual flow is actually fetched by a program (set up on a Wi-Fi laptop) that hijacks Google, diverting it from its utilitarian functions. Depending on the context in which the actor is, keywords are sent to the program and used as search strings in Google (thanks to a Wi-Fi PDA) so that the content of the textual flow is always related to the context. As the world-system reaches its limitations (depletion of natural resources, expected end of low-cost labour, the end of the ideology of liberalism, the fading of desire, etc. ), capitalism uses the irony of history to try to relaunch its paradoxical machinery by pushing back its internal limits: freedom of speech is revealed to be the prerequisite for the scientific colonization of intimacy; global terrorism and reality TV feed a spectacle regulated by the panoptical enslavement mechanism of the blogosphere; "Irational Behaviour" that was for long seen as the limit of any economical theory becomes the new field for the externalisation of advertising costs. Human Browser, the perpetual dandy, embodies this "Irational Behaviour". It is based on my former piece Epiphanies (2001), one of the first Google Hacks, inspired by J. Joyce. We are preparing other performances in different locations and contexts, in English, German, French, Italian and Chinese. Human Browser performance at HMKV, Dortmund. 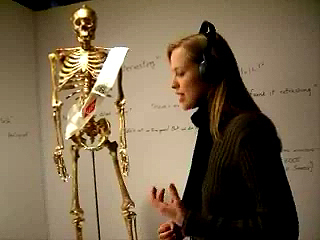 Exhibited at HMKV, Dortmund: HIS MASTER?S VOICE: On Voice and Language. Opening Friday 22 March 2013, 7 pm. With Christophe Bruno (FR), Erik B�nger (SE), William S. Burroughs & Anthony Balch (US), Asl? �avu?o?lu (TR), YOUNG-HAE CHANG HEAVY INDUSTRIES (KR), Dortmunder Sprechchor (DE), Jakup Ferri (KOS), Jochen Gerz (DE), Richard Grayson (UK), Asta Gr�ting (DE), Daniel Hofer (DE), Anette Hoffmann / Andrea Bellu / Matei Bellu / Regina Sarreiter (DE), International Institute of Political Murder (CH), Ignas Krunglevicius (LT/NO), Bruce Nauman (US), Stefan Panhans (DE), Julius Popp (DE), Laure Prouvost (FR/UK), Kathrin Resetarits (AT), Peter Rose (US), Manuel Saiz (ES), Anri Sala (AL), Richard Serra with Nancy Holt (US), Katarina Zdjelar (SR/NL), Artur Zmijewski (PL) and others. Curated by Inke Arns. May 29, 2010: Human Browser performance at NIMk(Netherlands Media Art Institute), Amsterdam, in Dutch & English with actress Lieke Jetten. ?Performmikka Internettikka? is an evening with internet/teleperformances by Annie Abrahams, Christophe Bruno, Constant Dullaart, Robin Nicolas and Igor Stromajer & Brane Zorman, focused on the relations between contemporary performance practice and the internet. Curated by Petra Heck. May. 15, 2010: performance of Human Browser with J�r�me Piques Instants Chavir�s, Montreuil, - "Take Shape - Make Shift" an exhibition by Charlie Jeffery. April 3 to June 13, 2010: Human Browser is presented at S.M.A.K. (Museum of Contemporary Art of Ghent) in the exhibition Electrified 02 - Hacking public space curated by Eva DeGroote and Thibaut Verhoeven. Artists exhibited are Ben Benaouisse, Carlos Rodr�guez-M�ndez, Amilcar Packer, Simona Denicolai & Ivo Provoost, Dogma00, Javier N��ez Gasco, Roberta Gigante, Messieurs Delmotte, Wilfredo Prieto, Miet Warlop, Helmut Smits, Christophe Bruno, Pierre-Laurent Cassi�re. For the opening, Human Browser was performed in English, French and Flemish by Ariane Loze. Watch the video (sequence 6). March 13th, 2010, from 17h00: I gave a talk with writer Christian Salmon (?Storytelling?, La D�couverte, 2007, ?Kate Moss Machine?, La D�couverte, 2010 ? ), at galerie Ars Longa. The talk was held together with a performance of my project Human Browser (with J�r�me Piques) who made people visit the exhibition "Les paradoxes du petit monde" together with curator Judith Lavagna. Jan. 28, 2010, Sonde 01#10, La Chartreuse. ?Human Browser? performance at the Boutique d?Ecriture du Grand Toulouse, by three different actors: Rapha�lle Bouvier, Maxime Potard and Annabelle Verhaeghe. I also gave a talk. Videos are available on Selfworld. Apr. 25, 2009: performance of Human Browser with Sabine Revillet at the Sonde ?04#09 - as you like it - les �critures du web -?. La Chartreuse, Villeneuve-l�s-Avignon. Apr. 23, 2009: Louise Boudevin is the Human Browser, at the festival Empreintes Num�riques, Toulouse. June 18 to Sept. 7, 2008: Human Browser has been selected by this year?s Artistic Director Carolyn Christov-Bakargiev, chief curator of Castello di Rivoli, to participate to revolutions online one of the venues of the Biennale of Sydney 2008. ?The 2008 Biennale of Sydney is presented at some of Sydney?s finest harbourside sites and visitors can take the Biennale ArtWalk from venue to venue along the water?s edge. For the first time the exhibition will utilise the astonishing former prison and shipyard, Cockatoo Island. For the fifth time Sydney?s only remaining undeveloped historical wharf - Pier 2/3 in Walsh Bay - will feature as a venue. Sydney?s leading arts institutions, the Museum of Contemporary Art, the Art Gallery of New South Wales and Artspace will again be dedicated to the country?s foremost international art event. Specific events and artworks will be presented at the Royal Botanic Gardens and the Sydney Opera House, plus in 2008, we are thrilled to present the first Online Venue for a biennale worldwide.? The festival was curated by Simona Lodi, Chiara Garibaldi, Manuela De Caro, Luca Barbeni, at the Accademia Albertina di Belli Arti in Torino. Human Browser was performed in Italian by Alessandra Lappano assisted by Simone Sandretti. With the support of the Centre Culturel Fran�ais de Turin. In case you wonder, the background sound in the video comes from a great installation by Gregory Shakar: The Analog Color Field Computer that was also nominated for the prize. Amazon-noir by Ubermorgen, Paolo Cirio and Alessandro Ludovico got the Honorary Mention. The other nominees were: Sensity - The Emergent City (Stanza), Shockbot Corejulio (5voltcore) and the Mikro Orchestra Project. Performance of Human Browser, interpreted in Italian by Simona Sagone, at the Future Web Festival 2007, curated by Luca Vaglio, FutureFilmFestival at Palazzo ReEnzo, Bologna. You can watch the videos in this article by Luca Vaglio, "Google va all'Actor's Studio", Affari Italiani. Sept. 23, 2006: performance of Human Browser, aka J�r�me Piques, at the festival "Les futurs de l'�crit" ("The Futurs of Writing"), Abbaye de Noirlac. Ecriture et lecture : nouvelles formes, curated by Emmanual Cyriaque, David-Olivier Lartigaud et al., Editions Hyx. Exhibited artists: Dan Graham, Pierre Bismuth, Yves Duranthon, Mongrel, ASCII Art Ensemble, Christophe Bruno, Martin Le Chevallier, Mark Napier, Peter Cho, Ben Fry, Young Hae Chang, Christa Sommerer and Laurent Mignonneau, Hansol Huh, Michael Mateas and Andrew Stern, Quantic Dream, Margarete Jahrmann and Max Moswitzer, Machinima selection. From August 5 to August 20, 2006, Human Browser is performing at the Sydney Esquisse Art and Design Festival, curated by Simon Horauf & al. The idea was to direct the performance from Paris with a remote live video link and I had to rework the code a little bit to have the whole installation set up. On the picture you can see the actress, Beccy Iland, with a webcam on her shoulder and Wi-Fi laptop in her backpack (a nice idea by Simon which allowed to simplify everything). Thanks to the live video link between Sydney and Paris, I can see and hear what Beccy sees and hears in Sydney. 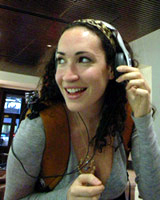 I input keywords on my computer in Paris and the text-to-speech audio flow hijacked from Google arrives in Beccy's headset. Feb. 2, 2006: Manon Kahle has become the first Female Browser. During four days, the visitors of the Transmediale festival in Berlin have fallen beneath her spell. You can also watch here the "guided tour" of the exhibition by Human Browser. The video was broadcast on the website of the french newspaper Lib�ration. 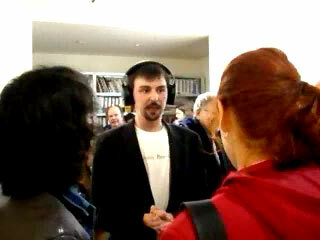 Jan. 10, 2006, Human Browser, aka J�r�me Piques, tried to start up a conversation with the visitors of galerie Sollertis in Toulouse, during the opening of my solo exhibition. La Pythie de Delphes : son nom vient du Python monstrueux qui habitait un trou, la b�ance de Ga�a, la m�re Terre, sur les lieux de la future Delphes. C'est l� que la Pythie prof�rait ses oracles, en des termes incompr�hensibles que seuls les pr�tres du sanctuaire pouvaient interpr�ter. Au moment de parler, la Pythie tombait en transes et entrait en contact avec Apollon, le Dieu vainqueur du serpent. Les grecs disaient qu'elle �tait en �tat d'enthousiasme : habit�e par le dieu. A l'�poque ancienne les oracles �taient rendus par des vierges parce qu'elles �taient physiquement intactes et de la m�me nature qu'Art�mis : c'�tait une disposition favorable pour garder le secret. " Diodore de Sicile, XVI,26, Ier si�cle av. J.-C. The video was broadcast on the website of the French newspaper Le Monde, the day after the elections. An Internet installation for television channel and computer assisted actor.